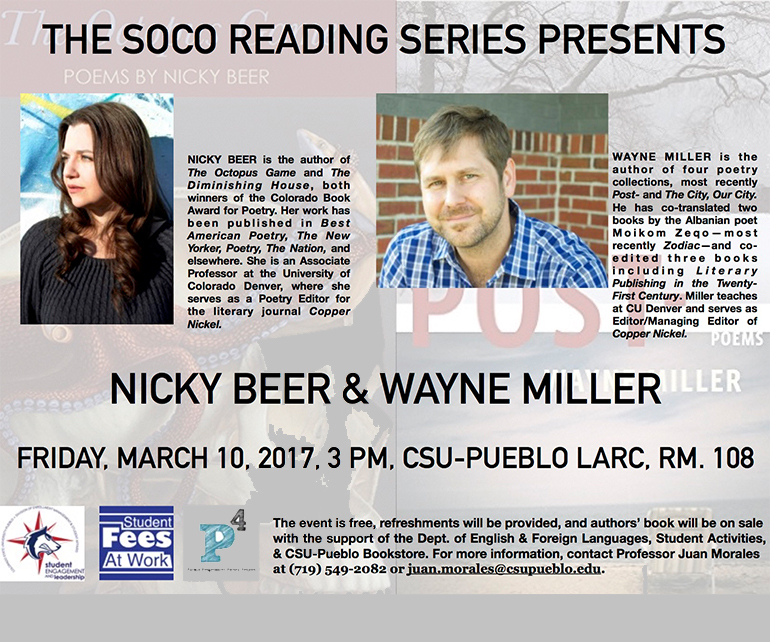 PUEBLO – Colorado State University-Pueblo will host a special matinee reading for the SoCo Reading Series, featuring award-winning poets Nicky Beer and Wayne Miller at 3 p.m. on Friday, March 10 Library and Academic Resources Center 108. Wayne Miller is the author of four poetry collections, most recently Post- (Milkweed, 2016) and The City, Our City (2011), which was a finalist for the William Carlos Williams Award and the Rilke Prize. He has co-translated two books by the Albanian poet Moikom Zeqo—most recently Zodiac (Zephyr, 2015), a finalist for the PEN Center USA Award in Translation—and co-edited three books including Literary Publishing in the Twenty-First Century (Milkweed, 2016) and New European Poets (Graywolf, 2008). Recipient of the George Bogin, Lucille Medwick, and Lyric Poetry Awards from the Poetry Society of America as well as the Bess Hokin Prize from Poetry, a Ruth Lilly Fellowship from the Poetry Foundation, and a Fulbright Distinguished Scholarship to Northern Ireland, Wayne teaches at University of Colorado Denver and serves as editor/managing editor of Copper Nickel. The event is free, refreshments will be provided, and authors’ book will be on sale with the support of the Department of English & Foreign Languages, Student Engagement and Leadership, & CSU-Pueblo Bookstore. For more information, contact Juan Morales, associate professor and director of creative writing, at 719.549.2082 or juan.morales@csupueblo.edu.